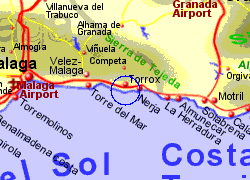 Torrox Costa situated on the Costa del Sol approximately 45Km east of Malaga is the relatively modern coastal development for the town of Torrox, which, as is often the case on the Mediterranian coast, was built 4Km inland to make it safer from invaders. The costa has an attractive promenade with beach bars and restaurants. 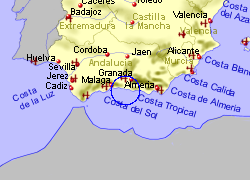 This sandy 9Km stretch of coastline is home to 7 sandy beaches (some quieter than others, and several with chiringuito bars) which regularly attain blue flag status in the past. 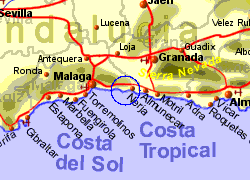 Map of the Torrox Costa area.